An elevated concentration of irritants in the air can trigger respiratory issues. When the winds are high and temperatures drop, we want our horses to be comfortable and protected. Nestling into a cozy stable may seem like a good solution, but there are health risks lurking in a tightly closed up barn. Horses with respiratory issues actually breathe easier in cold, dry air. However, this winter advantage is lost when horses are confined to a poorly ventilated barn where humidity and particulate matter in the air is high. Fine particulate matter and fungal elements from stored hay and straw are a major source of respiratory irritation in barns with poor ventilation. A variety of airborne substances have been implicated. Ammonia from bacterial breakdown of urea in urine is a well documented lung irritant in a variety of species. “Organic dust” is also an offender. This includes microscopic particulate matter from mites, plant material (e.g. beta-glucans), feces, bacteria and their products (endotoxin) and fungal spores. 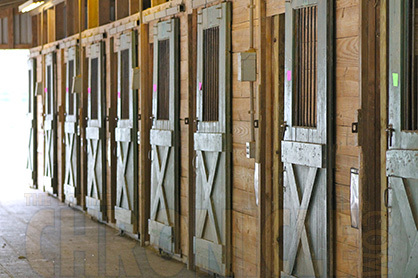 Keeping stalls clean and the building well ventilated are the first steps in reducing exposure. Using wood chips or synthetic bedding (e.g. paper based) reduces plant and fungal matter, but must be used in all the stalls. Horses are also exposed when hay or straw are stored in the same building, even in a loft. Horses with clinical signs should have their hay and bucket-fed meals thoroughly wet down. Always strive to remove horses from the barn when stalls are being cleaned and aisles swept. These measures will go a long way in reducing risk of developing lung disease and reducing breathing difficulty in horses that already have it, but they cannot completely eliminate exposure, and some horses will need more help. Medical treatment includes a variety of systemic or inhaled agents including corticosteroids, bronchodilators and mucolytics. There are also supplements you can use to assist the horse’s body in normal respiratory function and maintaining healthy tissues. Controlling exposure to lung irritants greatly reduces your horse’s risk of developing chronic lung disorders. If you do have to deal with signs of lung irritation there are many options, including nutritional support for normal lung function. Exposure to lung irritants and activation of the immune system results in considerable oxidative stress. Vitamin C is an important antioxidant in the lung, with studies showing low levels of vitamin C in the lung fluid of diseased horses. Oral dosages of 4.5 to 10 grams per day are used for the average size horse. Antioxidant activity can be boosted by pairing it with sources of plant antioxidants such as Grape Seed and citrus bioflavonoids. Nagging coughs are a common sign of both infectious and noninfectious lung disease. The coughing itself is also irritating. Human over the counter lozenges and chest rubs take advantage of the ability of aromatic oils like camphor, eucalyptus, menthol and orange to help maintain open, relaxed airways with thin mucus that is easily cleared. They work the same way in the horse, and equine specific products are available. Pastes are easiest to administer. Look for a soothing base with ingredients such as Aloe Vera, apple cider vinegar, glycerin and honey. Spirulina, 20 grams twice daily, helps the horse maintain lung homeostasis by stabilizing mast cells and supporting a balanced immune response. Jioagulan supports control of stress responses and maintenance of relaxed bronchial tone. Omega-3 fatty acids from flax seed provide the raw materials for normal balancing of inflammatory reactions. MSM also assists the body in balancing its responses to triggers of lung irritation. Uckele Health & Nutrition, maker of CocoSoya®, offers formulas to support respiratory issues. Vitamin C is a powerful antioxidant to support healthy immune function, and is a potent detoxifier of environmental and internal toxins. LungEQ provides Spirulina Platensis which helps stabilize the mast cells that release histamine. MSM supports normal regulation of inflammation. Flaxseed meal promotes balanced inflammatory pathways. Jiaogulan supports healthy histamine levels, airways, and immune response. Resprun Paste is a soothing, aromatic paste that supports healthy respiratory function and free breathing to help maintain open airways with Eucalyptus, Camphor, and Menthol. HerbalMune Plus provides herbs and nutrients to support immune function and fight free radicals.